The New Roads and Street Works Act 1991 in the United Kingdom sets out a Specification for the reinstatement of Openings in Highways, creating the need for a tool to check the performance of trench filling operations and compaction levels of materials and imposing penalties on contractors who fail to meet the specified standards. 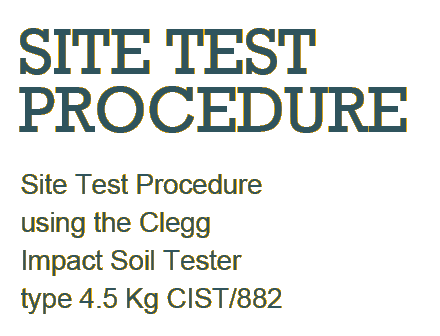 The Clegg Impact Soil Tester provides a compact and reliable instrument for monitoring and controlling the quality of reinstatements while the work is in progress, avoiding the need for re-excavation if later tests were to indicate poor workmanship. In order to obtain a reliable reading of Impact Value as displayed by the hand held Clegg readout unit it is necessary to carry out 5 test drops at each location. The procedure described below should be followed, regardless of the material being tested. Check that the guide tube is reasonably vertical and steady. Stand with both feet on the base flange, or rest one foot on the flange whilst steadying the tube with the side of the leg. remove the locking pin that retains the hammer inside the tube and unclip the meter unit. Press the button on the readout and check the display shows zero IV (Impact Value). Raise the hammer with one hand until the white indicator ring is level with the top of the guide tube. Make sure the cable is free and will not snag as the hammer falls; then drop the hammer cleanly. Observe the meter reading. Without moving the guide tube or releasing the readout button, repeat the procedure in (3) above for a further 4 drops to give a total of 5 readings at the test position. Assess the set of 5 readings. The first two or three drops effectively take up the surface irregularities and loose material immediately beneath the hammer. The readings thereafter should get progressively higher. The 3rd, 4th and 5th readings should level out and register the stiffness of the compacted layer under test. The 4th reading is the critical reading; it represents the degree of compaction being measured. If any of the readings is more than 2 IV lower than a previous reading or if the 5th reading is greater than the 4th reading by more than 2 IV, then the measurements are generally not reliable and the test should be abandoned at that location. 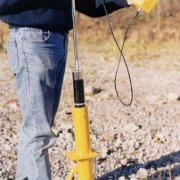 A repeat test should be carried out around 300mm away from the position of the abandoned test location. The number of drops from switch-on, indicated by the right hand digit on the liquid crystal display increments from 0 to 5 and theafter recycles from 1 through 5. After observing the 5 displayed readings of Impact Value at one location, release the press button on the readout unit. Install the guide tube at its next location and switch the readout on again to re-commence measurements. 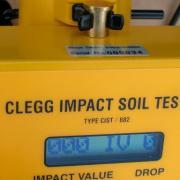 The three left-hand digits on the Clegg readout show the Impact Value (IV). The higher the compacted strength and stiffness of the material, the higher will be the reading of the Impact Value. The readout displays up to a maximum range of 101 IV. 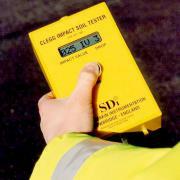 The readout unit can be fitted with different software that automatically detects whether successive hammer drops fall outside the 2 IV limits indicating a failed re-instatement as previously discussed. The readout displays ABORT ! when this is detected. This software also allows the readout to automatically display the 4th drop value when the operator keeps the front panel button pressed after the 5th hammer drop. 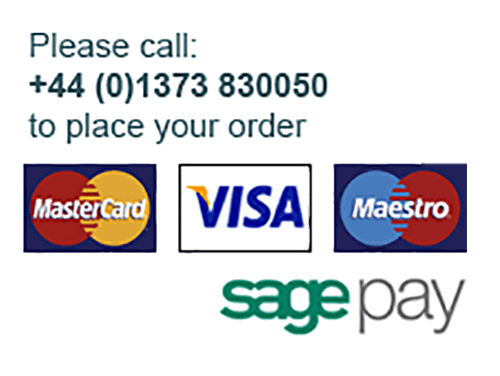 This software is supplied as a no cost option with new equipment supply. Simply specify the part number CIST/882/TREND in the order. The trend of lower and upper limits of permissible Impact Values are depicted in Table A below, where IV readings A-E are the values obtained on the 1st to 5th drops respectively. The 4th drop reading can be used as the critical reading providing the lower and upper limits shown in Table A are not exceeded. Clegg model CIST/882/TREND has the limits shown in Table A pre-programmed into the Readout unit. This model will also automatically re-display the critical 4th drop reading if the user keeps the on/off button pressed after the 5th drop.